A popular theory in the latter years of Sir Alex Ferguson's reign as Manchester United manager was that it would be preferable to be the boss that came after Ferguson's immediate replacement. As successor to the successor, you would be once removed from the great man, a modicum of pressure alleviated. Let someone else have the first chance to flounder in his shadow. But at least David Moyes, the new boss in question, will be a heavy favourite to lift some silverware when his time as United manager begins in earnest against Wigan in the Community Shield on Sunday. At the same time, another coach will be facing the first major challenge of his tenure, filling the shoes of a hugely successful predecessor. The 2013 women's Ashes will be contested over one Test match, three one-day internationals and three Twenty20s. Six points will be awarded to the winners of the Test, with two points apiece if the match is drawn. Two points are also on offer for the winners of each of the limited-overs contests. 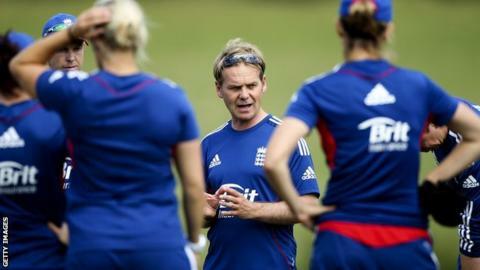 Paul Shaw, the new head of performance for the England women's cricket team, will see his side take on Australia on day one of the solitary Ashes Test at Wormsley. For Shaw's England, it will be the beginning of a campaign to regain the Ashes that will be stretched over Test, one-day and Twenty20 fixtures. It will also be the first opportunity to win a major series since former coach Mark Lane stepped down in May. In his five years in charge, Lane retained the Ashes as well as tasting glory in the World Cup and World Twenty20, at one point holding all three concurrently. By the time he departed, however, Australia owned all three crowns. "Mark Lane did an outstanding job," Shaw told BBC Sport. "His success should be celebrated. "I'm looking to build on that good work and move things forward to a new era, creating a brand of cricket that ensures England women will be successful in the future." In truth, Lane did not leave his post with the sort of glorious fanfare befitting the most successful England coach of all time. With the Ashes having been surrendered in 2011, England arrived at the 2012 World Twenty20 in Sri Lanka as favourites and played as such until defeat by Australia in the final. Charlotte Edwards's side were again fancied to lift the World Cup in India in February, but narrow defeats by minnows Sri Lanka and Australia ensured their title defence did not even stretch to the final - a poor return for perhaps the best-resourced women's team on the planet. But Shaw, who hails from pace bowler Katherine Brunt's Barnsley CC, does not believe there is the expectation of an immediate turnaround. The contest between England and Australia officially became known as the women's Ashes in 1998, when a bat signed by both sides was burnt at Lord's. The Ashes were encased in the trophy that is presented to the winners. "I'm not feeling any pressure at this point in time," said the 40-year-old. "We are looking to produce cricketers who will be capable of winning global tournaments. As long as I'm on that pathway, I'll be pretty happy. "There is expectation - an expectation to continue to raise the standard. Expectations come with the job." Shaw's two months in what is a newly created role have seen some tweaks to the England management structure. Whereas Lane was hands-on, Shaw has added former Northants coach David Capel to a staff that includes former Leicestershire spinner Carl Crowe. It is they who do almost all of the coaching, with Shaw as the foreman. On the pitch, England have beaten Pakistan in an ODI series and drawn with the same opposition in the T20 format. Off the pitch, all-rounder Jenny Gunn says Edwards's team have become more tightly knit than ever. "Paul is very laid back, always there to talk," said Gunn. "We've only had the Pakistan series with him so far so it's still quite new, but it's a really nice environment. "He just smiles all the time. He's quiet, but he knows a lot about cricket so what he does say is worth taking on board." According to Shaw, the relaxed approach - and the smile - are central to his modus operandi. "I'm very reflective," he continued. "I asses the environment, evaluating what I believe works well and what could be tweaked. "I'm a big believer in speaking when there's a need to speak, making the point as clearly, concisely and consistently as you can. "The foundation to the work I do is based on very good relationships with players and the management team, so I spend as much time as I possibly can creating those relationships. "The smile goes with me. That's important in building a rapport between players and staff." Though new to the job, Shaw is polished, even indulging in a little management speak occasionally: "cutting edge", "from world-class to world-leading", "systematic approach". But he also brings a freshness and a directness, even to the extent of asking the interviewer his opinion - "it's interesting to get an external view," he says. He will be judged on results, however, starting with the Ashes. With Australia arriving as holders and world champions in both short forms, England are in the unfamiliar role of underdogs, albeit slight ones in a contest that for the first time will include one Test, three ODIs and three T20s with points awarded for each fixture. "It's a fantastic opportunity to play against a very good Australia team," Shaw concluded. "I think it will be a good spectacle. "The three formats will challenge both teams. There is a need to be flexible over the three formats. "The team that adapts the best will have the best chance of winning the Ashes."